FILE - James Gatdet, who was then the spokesman for South Sudan rebel leader Riek Machar, is pictured in Addis Ababa, May 9, 2014. Attorneys representing a former spokesman for South Sudanese rebel leader Riek Machar on treason charges have withdrawn from the case, saying James Gatdet should have been freed under the cease-fire agreement signed last month. Kenyan authorities deported Gatdet to Juba in late 2016, shortly after he urged the removal of a Kenyan general in charge of peacekeeping forces when violence broke out in South Sudan's capital in July 2016. Lead defense attorney Monyluak Alor Kuol announced his team's decision to pull out of the case Thursday during a hearing before the South Sudan High Court. Kuol said the cessation-of-hostilities agreement that the government and opposition parties signed last month requires the release of all political detainees, including Gatdet, who is a member of the SPLM-in-Opposition. "Article 8 talks about all the parties that are signatory to the agreement should release the political detainees within 14 days from the time that agreement was signed. So we thought if we continue to participate in those proceedings before the court, we will be undermining that," Kuol told VOA's South Sudan in Focus. Under the cease-fire deal, all parties must release all persons who have been deprived of their liberty for reasons related to South Sudan's conflict, including prisoners of war, political prisoners, detainees, and abducted women and children. FILE - South Sudan's Riek Machar speaks to reporters following the signing of the peace agreement with the South Sudan government, in Addis Ababa, Ethiopia, Aug. 31, 2015. 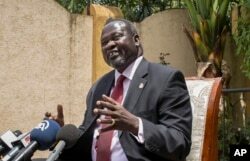 South Sudan Information Minister Michael Makuei denied last week that the government was holding any political detainees. Kuol said his team pulled out of the case on principle, not because government officials had harassed them. "We were never intimidated. We were never subjected to any threat," Kuol told VOA. After being deported from Kenya to South Sudan, Gatdet was immediately taken into custody by security forces in Juba, where he remains in detention. Charges against him include treason and conspiracy against the state. South African national William John, an adviser to Machar when the rebel leader returned to Juba in 2016 to become first vice president, also faces treason and conspiracy charges. Both men deny the charges. If found guilty, they could be sentenced to life in prison. Kuol is urging the prosecution team to implement the article of the cessation-of-hostilities agreement calling for the release of all political detainees. "We respect all the courts and we consider them to act according to the law. They have to be impartial. We trust them. But then our problem is with the prosecution, because the prosecution represents the government," Kuol said. Deng Acuil Deng, the chief prosecutor in the case, declined to comment on the cases, saying he was not authorized to speak to reporters. Gatdet's team was expected to present defense witnesses Thursday, but the court was adjourned until next month following the defense team's decision to pull out of court proceedings against Gatdet and John.